One of the most legendary RPGs of all time will soon be coming to your mobile phone - if you live in Japan. I've never tried to disguise my love for classic Square JRPG Chrono Trigger: I fully believe that the SNES RPG, released here in the States in 1995, still remains one of the best gaming experiences ever created. In 2008 it saw a re-release on Nintendo's DS, but that won't be its only new platform. A teaser site set up by Square-Enix has little concrete information other than the game's logo and a nebulous date of "Spring 2011," but given that the site itself is classified under "Square-Enix.co.jp/mobile," its meaning is obvious - the timeless JRPG is almost certainly headed to phones. Sadly, Square-Enix's mobile gaming efforts have thus far solely seen the light of day in Japan, despite the rising popularity of iPhone and Android gaming around the world. I won't lie, though; if they released Chrono Trigger on Android in the West, I'd totally pick it up on my Droid. You know, between this and the impending PSN re-release of Chrono Cross, it's almost enough to make a Chrono fan think that Square-Enix is priming the pump for a long-awaited third installment in the series. Of course, we all know that would never happen and that we'd just be setting ourselves up for disappointment. 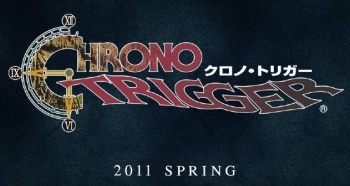 And yet, we still dream - of the shore of another world, and of finally getting a third freakin' Chrono game.